https://relationalrealities.files.wordpress.com/2015/12/dr0000_0082.mp3Sunday, December 13th is the Third Sunday in the season of Advent, a season of hope-filled preparation. Hope is a tricky thing because it is so often confused with optimism. Optimism is a positive outlook on life that flows from an experience of things going well. It’s opposite is pessimism, a despondent outlook on life flowing from an experience of fear. Both optimism and pessimism result from what we see as we look around us; how what we see makes us feel. Optimism and pessimism have a direct effect upon our capacity for imagination and what we fill our imaginations with. Many of us grew up in a world where whatever may or may not have been happening in our personal lives that left us either optimistic or pessimistic, our collective outlook on the world was essentially optimistic. We lived in a nation that was the winner and our expectation was that life could only get better and better. We believed that our destiny was to win and we enshrined that belief in a doctrine known as manifest destiny. We firmly believed that the accolade of the winner was the divine gold medal that was the surest recognition that as a nation, we were God’s favorite. Whatever America had to do in the world, and sometimes that involved getting our hands dirty, we willingly, as part of a deliberate national and foreign policy, performed actions that would otherwise have stained our collective conscience but for the fact that we knew we were right. We unquestioningly assumed that the way to peace was to talk sweetly and carry a big stick, and when necessary, distasteful though it was, to use our big stick in the cause of right. This attitude was embedded in the American national psyche from the very outset of the Republic and probably long before that, carried to these shores by its Puritan and Adventurist settlers. How many deaths will it take till he knows, that too many people have died?” The answer my friend is blow’n in the wind, the answer is blow’n in the wind. https://www.youtube.com/watch?v=vWwgrjjIMXA Whether as a nation acting on the world stage or in our internal domestic spheres, the belief is the same – that right is achieved and safety assured at the end of the barrel of a gun. Our children are reared and always have been reared within this overt as well as subliminal message. From the Cowboy and Indian comics of yesteryear to invasion by aliens often in cyborg form stopped only by the superhero of today’s children’s TV cartoons, this message is continually reinforced. The truth is that the Lone Ranger can only remain the Lone Ranger as long as he has an identifiable enemy in his sight, an enemy evil enough to be dispatched with his silver bullet. When our leaders are absent or fail us; when our God is invisible and from all appearances absent in our lives; when we don’t know how we can keep going; when we are consumed by our fears and threatened by those who are not like us, those are the moments when new idols are imagined and fashioned and desperate people give them their ultimate concerns, devotion, and focused attention (p. 24). You go into these small towns in Pennsylvania and, like a lot of small towns in the Midwest, the jobs have been gone now for 25 years and nothing’s replaced them,” Obama said. “And they fell through the Clinton Administration, and the Bush Administration, and each successive administration has said that somehow these communities are gonna regenerate and they have not. 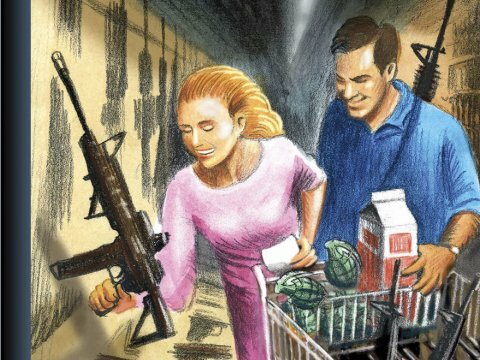 And it’s not surprising then they get bitter, they cling to guns or religion or antipathy to people who aren’t like them or anti-immigrant sentiment or anti-trade sentiment as a way to explain their frustrations. No community enjoys being identified in this way, but Obama’s words apply to so many communities across the land. The ferocity of many reactions to his comments only bear testimony to their uncomfortable truth. The bitterness and disaffection of so many Americans is the fertile breeding ground for fascism that lies dormant beneath the surface of all societies. As we see in Western Europe with the rise of parties from the extreme right, America’s current experience is not unique. But the unrestricted access to guns including those designed only for combat situations is what makes America unique. Even Justice Scalia, with whose worldview I am generally not in agreement, has declared that the right the bear arms is not an unencumbered right exempt from regulation. History and politics or how many deaths will it take till he knows that too many people have died? History and politics are converging in an increasingly frightening scenario as the people who believe that right is achieved and safety protected at the end of a gun are now becoming increasingly afraid. What we embody as individuals we also embody as a culture and hence many no longer find Donald Trump frightening as he dons the mantle of the demagogue who says that which in saner times would remain unthinkable. America has long indulged in a love affair with the history of Ancient Israel as recorded in the earliest parts of the Old Testament. Mesmerized by an image of itself as Ancient Israel, America, God’s favored nation is largely unconscious of the way it has perverted the symbols of the Judaeo-Christian Tradition into a piety that champions redemptive violence (Walter Wink) evidenced by the deafening silence of large swathes of American Christianity in the face of the alarming statistics. Culture has a long history of donning the mantle of religion. When this happens idolatry results. James Atwood speaks https://vimeo.com/61185293 of violence, not Christianity as the real religion of America. As God’s appointed guardian of world peace, we seem ready to use violence to ensure righteousness. Believing our motives are beyond reproach, redemptive violence has become an instrument of peace. He says that when you give a person a gun you leave them struggling with two opposing feelings, one of omnipotence, the other of fear. In steps the NRA philosophy that only a good guy with a gun can stop a bad guy with a gun. The crowds have heard a word in the wilderness of their life. It is a prophetic word, a word of deep insight, by which they recognize that all is not well in their life and their world. It is also a word of hope and rejoicing, a word of God, that says all can be well. It is a word that joins the wilderness and paradise and makes them two sides of the same reality. The Prophet Zephaniah is this week’s voice of the transgenerational vision of God’s dream for humanity. Let our waiting in this present time be fruitful through planting the seeds of hope for a future which we may not see, but which we long to bequeath to our children and their children’s children. The enemy of hope is fear. Fear has a direct effect upon our capacity for imagination and what we fill our imaginations with. Advent reminds us that the season of hope is not same as the season of optimism. Hope is always for that which we as yet we cannot see, but which we know we are in dire need of. As T.S Eliot penned in the lines of his poem East Coker: hope is believing and loving in the waiting (my paraphrase). Advent is the season of hope, and when all the preparations are done what remains is the most difficult thing of all, the waiting! St Augustine said: Hope has two daughters. Their names are anger and courage; anger at the way things are, and courage to see that they do not remain the way the are. How many deaths will it take till [we] know that too many people have died? The answer my friend is – one is too many. Dr. Linda Gaither courtesy of the Episcopal Peace Fellowship quoting James Atwood, comments there are 300 million guns, almost enough for every man, woman, and child, circulating in America today, with 3 million more sailing off the assembly lines each year. The big brother of this gun “snowball” is our vast military-industrial rolling juggernaut that spends $698 billion dollars a year on military preparedness, equal to the expenditures of the next nineteen countries combined. Those 300 million guns circulating on our streets account for 30,000 deaths a year. More American citizens were killed with guns in the 18 year period between 1979 – 1997 (651,697) than all the servicemen and women killed in battle in all U.S. foreign wars since 1775 (650,858). One-half of all gun deaths are suicides. Every 36 hours a U.S. war veteran takes his or her life. 3,285 children are killed unnecessarily by guns in this country every year, many in the tragic and stupid accidents we read about in the newspaper. Yet no sane gun legislation on behalf of reducing these numbers has passed Congress since the Brady Bill, which celebrated its 20-year anniversary on Feb. 28, 2014. Our lawmakers are paralyzed and prohibited from even engaging in meaningful dialogue on this issue. But they aren’t so paralyzed that legislation in support of the Gun Empire is slowed down: for example, the 2004 removal by Congress of the ban on assault weapons or the 2005 Lawful Commerce Act, which denies victims of gun violence the right to sue manufacturers, distributors or dealers for negligent, reckless or irresponsible conduct. Atwood points out that no other industry in America enjoys such blanket immunity and protection. Thus, when 30,000 Americans die by gunfire, Congress reacts to protect guns, along with their institutions, factories, distribution systems, and private sellers. Atwood contrasts the failures of government to respond to our gun epidemic with its response to outbreaks of disease: when 5 persons were hospitalized in the Southwest with e-Coli found in spinach, the government immediately shut down the entire spinach industry, putting it under surveillance 24/7 and quarantining suspected forms. But with guns … more is better! Guns save lives. An armed society is a polite society. More guns mean less crime. Gun rights are God-given rights. In Kentucky, churches are raffling off guns to increase attendance.